Born: 16 November 1875, Berlin, Germany. Died: 13 May 1934, Pretoria, South Africa. August G.H. Rudatis trained in horticulture at a nursery near Berlin during 1892-1895. From 1896 to 1898 he worked in the Botanic Garden at Zurich under Dr Hans Schintz* and subsequently was in charge of the Alpine garden of the new botanic gardens at Dahlem in Berlin. In 1900 he accepted a three year appointment as botanist and plant collector to a company in the Cameroon (then a German colony). He took part in an expedition into the interior and during the last year of his contract established a rubber and cocoa plantation on the Cross River, near the Nigerian border. Early in 1904 Rudatis came to Natal and settled on a small farm at Umgai, some 20 km south-south-east of the railway station Dumisa in southern Natal. His farming venture was not very successful, nor was his attempt to establish a nursery for indigenous plants and cacti. He was an ardent conservationist and made extensive collections of plants, as well as a collection of insects (mainly Coleoptera) in the vicinity of his farm. Over the years he corresponded with Hans J. Thode* and visited John M. Wood* in Durban from time to time. The plants he collected during 1904-1905 were sent to the Botanic Gardens at Berlin and were described by H.R. 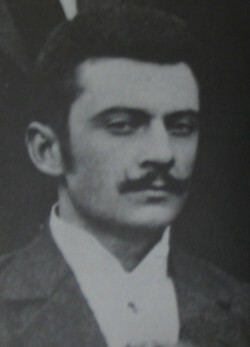 Rudolf Slechter* in 1907. Other plant specimens were sent to the University of Zurich, the Royal Botanical Gardens at Edinburgh, and to Wood in Durban. He was also interested in birds. At some time during 1904-1906 he met Thode on the farm Kronsberg, near Noodsberg (a railway station fome 20 km east of Dalton), and they started a combined checklist of birds. Rudatis married in Germany in 1907. In 1921 he received a serious head injury during an attempted robbery, which seems to have put an end to his collecting. The next year he moved to the Middelburg District in the Transvaal and then started farming near Brakpan with the help of his son. When he moved to the Transvaal he sold his personal herbarium, which was subsequently incorporated in the Compton Herbarium, Cape Town. The plant species Drimia rudatisii and Ceropegia rudatisii were named after him by Schlechter, and Stachys rudatisii and Eugenia rudatisii by others. Killick, D.J.B. Hans Justus Thode (1859-1932), pioneer plant collector in the Natal Drakensberg. Bothalia, 1977, Vol. 12(2), pp. 169-175.